You have your first job out of seminary. You learned Greek and Hebrew. You took classes on how to prepare a sermon that is Biblically based and is applicable to the lives of those in your congregation. You are ready to make an impact for God’s kingdom. There is most likely a component you are missing. You need more than seminary. All jobs have the technical skills one must learn to be good at their job. In the case of a pastor, these are the classes and areas you studied at seminary. CPA’s must know tax code, lawyers must know the law, CEO’s must know the ins and outs of their industry. To be a good leader in any industry, you must learn the soft skills of leadership. Your job as a pastor is to lead, to shepherd, just as Jesus led his disciples. Your job is to develop people, to help them become more Christ like. 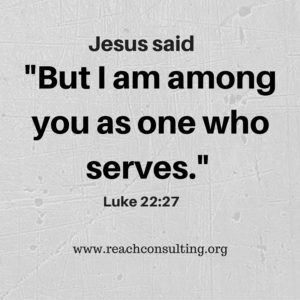 Jesus was the ultimate Servant Leader, which means part of your job in becoming more like Christ is becoming a Servant Leader as well. Robert Greenleaf coined the term Servant Leadership. Greenleaf states servant leadership “emphasizes an increased service to others, a holistic approach to work, promoting a sense of community and the sharing of power in decision making.” Servant leadership is based upon a relationship. The desire isn’t what can I get out of this, but what can I do to enhance the lives of those I lead? One of the main components missing in leaders in the church and beyond are soft skills. Soft skills include communication, caring for individuals, sharing vision, creating shared values, and empowering followers, to name a few. When you want to make changes but include staff in how the changes can be made, you create buy-in for when the time comes to make the change. When you show you care about your employees, you create a greater level of loyalty. When you know yourself and those you lead, you have the opportunity to create a place where people are excited about what is happening in the organization and are fully committed to the work of the local body of Christ. As a leader, you should be committed to the growth of both those you lead and the organization. You can’t forsake one over the other. You must lead well in order to develop more leaders. You should be creating more leaders not more followers. To lead a church, you must know God’s word. That is a given. But you need more than seminary to lead well. You must focus on personal development and intentional leadership. Have you thought about your own leadership development? How can we help you Reach your potential as a leader? Previous Post: « What’s In A Name?